Twenty one (21) Air Niugini Aircraft Maintenance Engineers( AMEs) including two females have received their United Kingdom , European Aviation Safety Agency AME licenses in a ceremony in Port Moresby on Tuesday 10th Oct, 2017 after successfully completing five years of training. This license granted by the UK Civil Aviation Authority is recognized worldwide and now allows these young Papua New Guineans to be able to certify the completion of maintenance on United Kingdom registered aircraft. They could even easily convert their UK Licenses to an Australian or New Zealand (NZ) License and certify for Australian or NZ Aircraft. 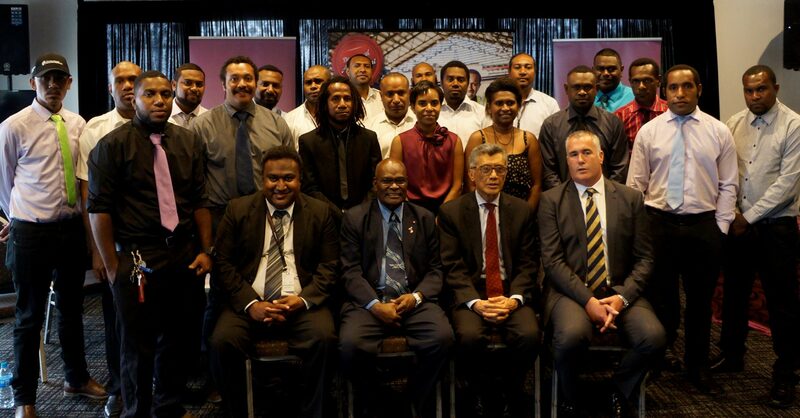 Air Niugini Chief Executive Officer, Mr Simon Foo in congratulating the AMEs said it is a higher level training that is recognized worldwide, adding that using the UK license, Air Niugini AMEs can apply for a PNG AME license without having to complete the CASA PNG AMEL Basic Examination requirements. He said it took the two groups five years to successfully complete and attain their UK licenses, an achievement Air Niugini is very proud of. Air Niugini invests more than half a million kina for each engineering cadet to be trained up to a level where they can certify completion of maintenance of Air Niugini aircraft. The two groups of AMEs did their initial Cadet AME programs with Air New Zealand Aviation Institute and Aviation Australia respectively. Following a four year cadet program, it normally takes 12 to 14 months for the AME’s to get their PNG License. The first group will get their PNG License by December this year. Mr Foo also said the board and management of Air Niugini will be investing in hangar facilities at the Jacksons airport that will eventually mean heavy maintenance of aircraft to be carried out in Papua New Guinea, resulting in cost savings. “ This will reduce overseas expenditure as well as build the PNG Engineering staff capacity. These 21 AMEs are fortunate to be among those who will be using this facility and they are the future of Air Niugini” Foo concluded. Also present at the ceremony was Chief Executive Officer and Director, Civil Aviation Safety Authority, PNG (CASA PNG) , Mr Wilson Sagati and Air New Zealand Aviation Institute’s Development Manager, John Ogilvie.